Last fall I was surprised and thrilled that Iyanla Vanzant suddenly popped up on the Hayhouse Radio schedule, Louise Hay‘s free 24 hour online inspirational station. I have been a huge fan of Iyanla’s since college. Her books Tapping the Power Within and One Day My Soul Just Opened Up were incredibly empowering for me. My friends found themselves with Iyanla’s book In the Meantime: Finding Yourself & the Love You Want . We were loving her ride, on a life journey and a path with her as a guide, enjoying Oprah’s “Tuesdays With Iyanla.” Then came the weird “Iyanla” talk show produced by icon Barbara Walters, and Iyanla disappeared. I remember seeing Iyanla’s appearances on the TV shows “Starting Over” and “Let’s Talk About Pep,” but still missing a real does of Ms. Vanzant. Her daughter was my age and I really related to this woman who made a way out of no way to because a lawyer and teacher of spirituality. I wondered what was going on. 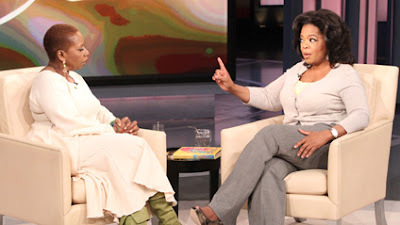 I had heard erroneous rumors that Iyanla disappeared from the Planet of Oprah when she made ultimatums and demanded money. I must admit that this turned me off quite a bit. Recently, Iyanla Vanzant and Oprah Winfrey appeared together on the Oprah Show to set the record straight in a 2 episode extravaganza. Apparently the last 10 years have been pure hell for Iyanla. Her daughter died, her son went to prison, her husband left her and she lost all of her money. Talk about when it rains it pours. Wow. Here are the Top 3 Lessons I Learned… from watching Oprah and Iyanla duke it out and then thankfully, reconcile. Oprah and Iyanla are both role models and mentors for me. My assumption was that they had it all together. I almost saw them both as super-human, in the way that we view those particularly elders who we place on a pedestal. Watching them hash out their you said/no, I didn’t/but I meant beef reminded me that we are all human. Clearer communication could have saved their grief, stress and working relationship. However, as Iyanla said, she had to walk this path this way to learn what she needed to learn. Iyanla was talking the talk but not walking the walk but she didn’t know that. That’s why I always stress that I am a work in progress and that my work is a guru-free zone. While she was teaching us self worth she had a book deal where she didn’t own any of her intellectual property. While she was helping us to feel comfortable in her skin she too a talk show gig where she had to prepare in the hallway because she had no office. I was astounded that with 10 books Iyanla had the same book deal terms that I have. I wouldn’t think that someone at her level would not have ownership of her work. I learned so much listening to her talk about this. When I signed my book deal I was so grateful that someone wanted my work that I would have signed anything. I would never in a million years have thought someone like Iyanla Vanzant would feel the same way. 3) LOVE MEANS NEVER BEING AFRAID TO SAY I’M SORRY. On Iyanla Vanzant’s radio show, she teaches the ancient Hawaiian Ho‘oponopono prayer. Ho‘oponopono is about forgiveness and reconciliation. Ho‘oponopono means make it right. It is about forgiving and being forgiven. There are four parts of this apology prayer: I love you; I’m sorry; Please forgive me; Thank you. I know that all of the Hayhouse Radio listeners were shouting at the TV along with me, wow, Iyanla is doing the Ho‘oponopono prayer! I’ve worked in television in various capacities since I was 21, starting with an internship with anchor woman Carol Martin. People always say, be yourself but it’s been an evolving process to learn what that means because we all have so many selves. Until now, media has been a field where you had to wait for others to greenlight you and this is the most challenging aspect of my exciting career. It’s not like other careers where your trade or degree is your passport to your dream position. It’s easy to speak the words be yourself but I have lost jobs because they felt I was 10 pounds overweight, thought I was too dark or at twenty-eight too old. When I was twenty-four my agent subtracted four pounds from my age to make me more hire-able and to add more years to my on-camera career. I’ve never been overly concerned about aging in real life in terms of biological clocks or anything like that but with work I have been extremely concerned. In any public work related stage where they asked, how old are you, I would reply, I don’t want to give an age, and they would say, you have to. So then I would give them what we call in the entertainment industry, the stage age. Before this minute I saw lying about my age as a necessary evil of working in the entertainment industry but I release that now. I don’t want my walk and talk not to match. The biggest lesson I earned in watching the Iyanla Vanzant Oprah Winfrey interview is that no employer holds my fate in their hands. They are not my source. I may lose some positions but I release it. My work, my opportunities, my blessings come from a higher power. So there. THANK YOU, Iyanla Vanzant and Oprah Winfrey for letting us into your healing process. It shows that none of us is perfect and that we can always learn something. I would very much enjoy Oprah giving Iyanla a TV deal now. Come on Oprah, you have you OWN Network in need of shows and a magazine in need of columnists like Ms. Vanzant. Rock it, Iyanla. We wish you love and thank you for the love lessons.